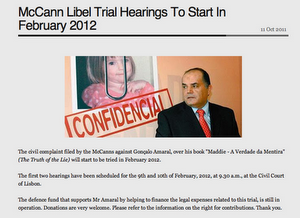 GONÇALO AMARAL - BRITISH MEDIA SMEAR CAMPAIGN: Do McCanns Plan To Lie Under Oath In Portugal ? Without Question ! Do McCanns Plan To Lie Under Oath In Portugal ? Without Question ! Kate and Gerry McCann have met with their lawyers in a whirlwind visit to the Portuguese capital on Wednesday. The parents of missing toddler Madeleine McCann met with their prominent Portuguese lawyers Rogério Alves and Isabel Duarte before returning to Britain the same day. The visit also marked the first occasion Mrs McCann has been in Portugal in over two years. It is thought the visit was centred around legal proceedings brought against a former lead detective in the case. 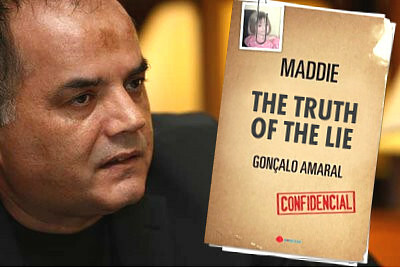 A Lisbon court ruled a fortnight ago that Gonçalo Amaral could no longer publicise nor discuss the contents of his book in which he points the finger of suspicion at Mr and Mrs McCann, suggesting that Madeleine is dead and that her parents were involved in concealing her body. ‘The Truth of the Lie’ was on the verge of being published in English, explained António Cabrita, lawyer for the former detective, and said he believed the ruling coincided with this very fact. Kate and Gerry McCann have also been reported to be in the final stages of mounting a million pound civil claim against Gonçalo Amaral. “We are currently demanding €1.2 million in damages, but we are reserving the right to increase this value as soon as we can ascertain what profits have been generated from the sale of this book”, Ed Smethurst, a lawyer for the McCanns was reported as telling the Lusa news agency when news of the injunction emerged.